DL & Co Limited Edition Holiday Gift Box – Pre-Orders Open Now! DL & Co has a new limited edition gift box, available to pre-order now! The Limited Edition D.L. & Co. Holiday Gift Box is $99 and will ship October 24. This box has a retail value of $250! Lavande Citron: Lemon, Grapefruit, Lavender, Peach, Vanilla, Heliotrope. Cedre Noir: Cedarwood, Oakmoss, Ylang-Ylang, Vetiver, Tonka Beans And Amber. Ambre Epice: Ginger, Pepper, Rosemary, Cardamom, Cinnamon, Myrrh, Amber, Patchouli, Vanilla And Moss. Vanille Peche: Peach, Bergamot, Jasmine, Rosewood, Vanilla And Cinnamon. Chilled Vodka: Like A High-End Vodka Chilled To Perfection And Enjoyed In Its Purest Form, This Carefully Orchestrated Blend Of Lemon, Honey, Ginger And Birch Leaves Just Leaves Us To Say: Cheers! Winter Blossoms: An Opulent Blend Of Pink Peppercorns, White Peony And Cool Cypress Are Elegantly Blended With Notes Of Iced Rose And Frozen Citrus. A Soft Blend Of Patchouli And Amber Provides A Touch Of Warm Contrast. 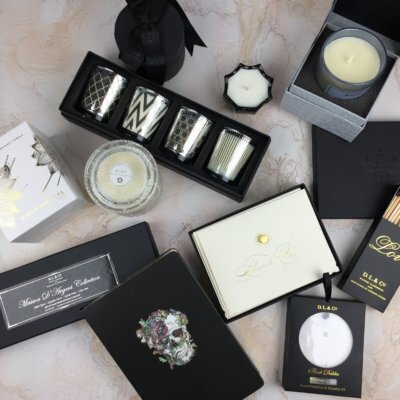 “D.L.& Co. was born of the desire to bring objects of opulence and beauty to those who yearn for the uncommon and the exquisite.” They carry luxe candles and other curiosities – many of which are decorated with skulls or other alternative imagery! What do you think of this limited edition box? I think I have to get this one!